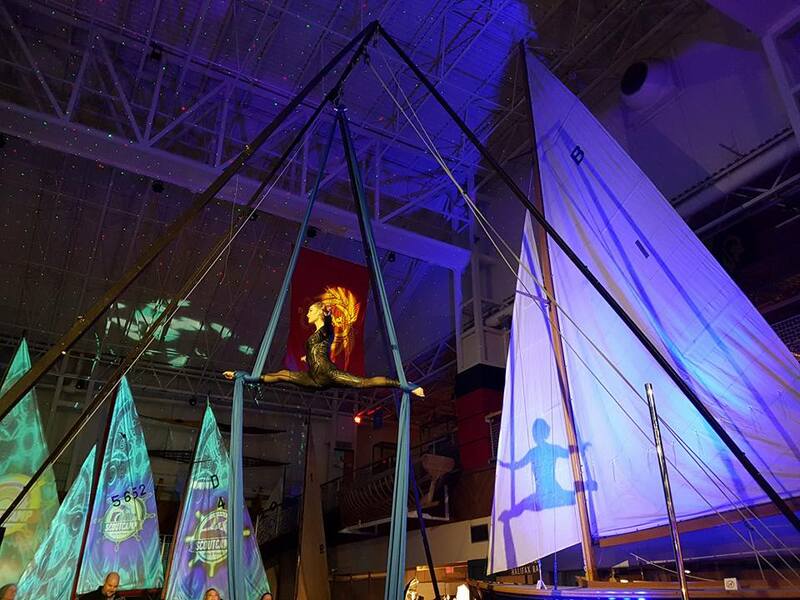 Thank you for considering the Maritime Museum of the Atlantic as the venue for your upcoming event. We currently offer bookings in three spaces, and we are here to help you find out which will suit your needs. With nautical vessels spanning the century the Small Craft Gallery is an impressive room with high ceilings to accommodate the masts of our collection and large windows looking out onto the harbour. 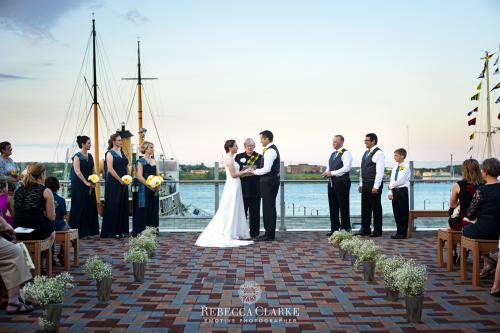 Here the museum has hosted weddings, arts presentations, lectures and receptions. This venue adds a sense of grandness and history to any occasion. If you are hosting a smaller meeting try our Second Floor Meeting Room suitable for tabled discussions of 20 or rowed seating (theatre-style) up to 30. 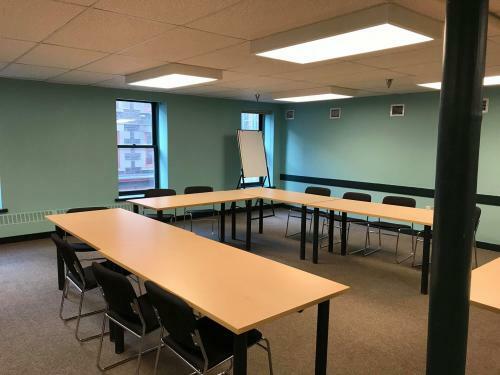 This space is great for community meetings or small presentations. Our outdoor space provides beautiful views of our working harbour and the C.S.S. Acadia. This space lets you showcase Halifax to your guests while allowing for sunshine and fresh air. Accommodations for weather concerns must be arranged with us in advance. Because we are primarily a museum: catering, must be arranged with outside companies. Luckily we have a number of groups who have worked with us in the past, and are happy to provide a list of those who are familiar with our facility. Cost: $1,091.80 taxes in for a rental of the Small Craft Gallery from museum close (5:30PM) until midnight. The rate for not for profit groups is $544.85. - Add the observation deck for an additional $300! Number of People: The room is able to accommodate up to 110 people seated or 250 standing. Floor plans are available to the right. Equipment Available: Rental includes use of our 15 six-foot folding tables and 100 black plastic chairs. We do not supply any linens, they must be provided by caterers. We also offer use of our AV equipment for a fee of $60.85, which includes sound system, microphone and projector options. Booking Times: This space is available from 5:30 (Museum close) until midnight. We have a catering prep area we can make available at 1pm day of, and allow for booking past midnight at a maximum of $100 for 1 additional hour. *Because we are open late on Tuesday evenings we are unable to rent this space during that time. Lighting : The client may hang lights from the railing along the second floor, or up-light the sails. No decorations or lighting may be placed on artifacts or display cases, or in any manner that could potentially damage the items. No smoke machines or confetti cannons may be used. Food Policy: Food and drink are restricted to the first floor. If the client needs to host a pre-reception, our lobby is an ideal location for this use. If you wish to use the courtyard for any portion of your reception it should be noted that the courtyard is also our load-in area and this will require coordination with your caterers. Alcohol policy: Alcohol is permitted in the Small Craft Gallery, but a Special Occasion license must be obtained separately from Nova Scotia Alcohol and Gaming. Number of People: Our meeting room suitable for tabled discussions of up to 20 people or rowed seating (theatre-style) for up to 30. Equipment Available: Rental of the Meeting Room includes access to the in-room chairs (30) and tables (six 6fts). The client may alter the set-up of the room for the purpose of their event but are asked to return it to its previous state after they are finished. Booking Times: Booking is available at all times the museum is open. Evenings are possible as well with prior arrangement. Access: The meeting room is wheelchair accessible via elevator. Amenities: There is an in-room smart board, and kitchen-- use of both is complimentary. Food Policy: Food and drink are restricted to the meeting room during a daytime meeting. As visitors to the museum are asked to not consume food or drink in the galleries, we ask that people at the museum for their meeting do the same. Alcohol policy: Alcohol is not permitted in the Meeting Room. Cost:he cost for booking our observation deck is $500 alone, or $300 when paired with booking the Small Craft Gallery. Number of People: Our observation deck’s capacity is 150. Equipment Available: Rental of the observation deck includes access to our 15 folding tables and 100 plastic chairs, as our Small Craft Gallery bookings get priority, please arrange your needs ahead of time so we can try to accommodate. Booking Times: Booking is available after hours until 11pm- with possible exceptions if the event is open to the public. Amenities The observation deck sports beautiful views, and provides access to our museum barbeque. Please note that events must provide their own propane. Food Policy: Food is permitted on the observation deck with prior arrangement, however guests are not allowed to bring it indoors where we house artifacts. Alcohol policy: Alcohol is permitted, but a Special Occasion license must be obtained separately from Nova Scotia Alcohol and Gaming. 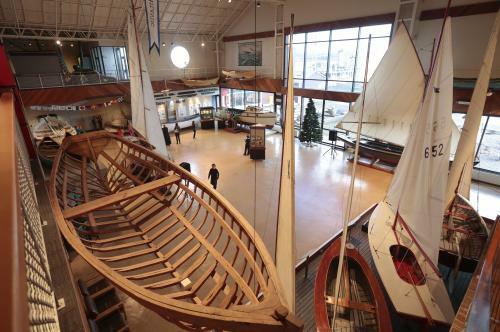 The Maritime Museum of the Atlantic has a number of authentic period spaces in its galleries which can serve as the perfect location for film or video productions. In particular, the Museum’s vessel CSS Acadia is frequently in demand as a backdrop for a variety of projects. A rare example of a riveted steel vessel, the 180 foot steamship was built in 1913 and features well preserved Edwardian interiors. In the past, Acadia has been used as a wartime cargo ship, a 19th century immigrant ship, a hospital ship, and even a Japanese destroyer. A daily location fee is charged for all film work at the Museum, based on an eight hour day. An hourly overtime rate will be charged for filming beyond the eight hours or for extraordinary hours. For major projects, a flat fee may be negotiated. All film productions are subject to the Nova Scotia Museum’s Film/Video Production policy and producers must sign a Letter of Agreement.